You got some cute stuff! I love your new necklace. Love that necklace! And those labels are sooo cute! Oh my gosh how cute!! I love the necklace, its so pretty. And your labels, and gift wrapping on the box is just the cutest idea!! I love that necklace, I will definately have to get one of those. Getting fun stuff in the mail is the best! How fun and cute! Stationary is so much fun! How fun!! You received some really cute things. By the way love that necklace. LOVE those labels. So cute! 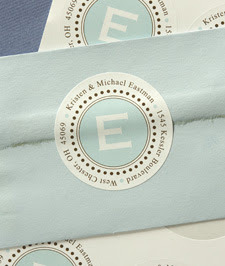 Looooove my wax seal monogram. It is so gorgeous and I love to use it on special letters. When Coco was born I wrote heartfelt letters to all the god parents on gorgeous stationary with the wax seal on the envelop! LOVE! All of your mail love is adorable. So cute! Isn't getting snail mail the best?! oh my goodness, I LOVE that headband. does anyone know where it's from?